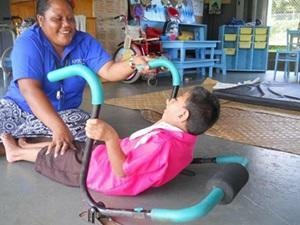 In Samoa we work with a number of organisations that care for children and adults with various physical disabilities. There is a real lack of qualified physiotherapists in Samoa, which is why your skills will be so appreciated. How can volunteer physiotherapists help in Samoa? As a volunteer physiotherapist you will be working for one, or a variety of care placements. This may be a special education school, the Society for Disabilities, or the Samoa Victim Support Group. You will be based in and around Apia, the capital of Samoa. All of the partners that Projects Abroad work with support vulnerable groups of people. The placements aim to provide a better quality of life for the children and adults that struggle with disabilities. The staff at the placements encourage participation from the families and members of the wider community, to ensure that the patients can have a more active and fulfilling role within the community in which they live. Conduct assessments, analysis, planning and treatment of patients. Evaluate patient conditions and adapt treatments accordingly. Educate teachers, family members and caregivers about conditions, prognosis and home exercise programmes. Assist with training, advising and supporting local physiotherapists in the management of patient care, as well as self-learning and research activities. You will work from 20–35 hours a week (Monday to Friday), and sometimes out of hours depending on the individual project and how you develop your role with your project supervisor. This project runs all year. Volunteers are required to join this project for a minimum of 8 weeks. For anyone who specialises in sports physiotherapy, there may be an opportunity to work with the Samoa Rugby League. Please contact us for more information. You will be involved with a friendly and highly dedicated team who are committed to the service they provide. Working with often limited resources and staff lacking technical knowledge and training you will be able to adapt and develop your existing expertise to a different working environment. You will often face challenges not experienced in your home country. Through this cultural exchange you will learn different methodologies and techniques in your own discipline. Assessments of individuals with physical disabilities or injuries, and using your expertise to suggest alternative treatment techniques (where appropriate). Assessment of the systems in place at the project, and suggest ways to improve efficiency and effectiveness. Holding workshops with family and community members to educate and train on techniques for caring for people with physical disabilities or injuries. Using your expertise to train staff and other volunteers. Using your initiative to identify, set up and manage new projects/programmes. Collaborating with project partners to improve systems for monitoring existing or new projects/programmes. Creating and/or developing evaluation reports for projects or individuals to help with continuity between volunteers. Safe accommodation with a host family close to your place of work. If you have at least a Bachelor’s Degree in Physiotherapy or a closely related subject then you will be suited for this project. Ideally, a qualified physiotherapist would also possess at least two years’ experience of practising professionally, however any experience will be appreciated and even recent graduates will be able to share their knowledge whilst gaining practical experience.